The editor who added this tag elaborates: Some moves still need the exact frames their armor is active for. Ike's super armor from his Aether move. Notice how Ike didn't take any knockback from Marth's Critical Hit, which is an invariable OHKO under standard circumstances. Armor (PAL English armour), also called flinch resistance, knockback resistance, super armor (for infinite knockback resistance), or heavy armor (for finite knockback resistance), is an effect of certain moves or actions in all Super Smash Bros. games. When a character has super armor, they will generally not flinch nor take any knockback when attacked by a harmful hitbox; while heavy armor also provides protection from attacks, a sufficiently strong attack can still deal more damage or knockback than the heavy armor can sustain, and cause the character to receive full knockback. Most types of armor only affect knockback and the attack's full damage is still taken; however, Kirby's Stone, Ryu's Focus Attack, and King K. Rool's stomach grant damage-based heavy armor that reduces the damage taken to half (or negates damage entirely in Brawl in the case of Stone), and two Final Smashes grant super armor with the same damage reduction. Armor can also be known as light armor if it only protects against extremely weak low-knockback attacks, such as jabs or individual hits of multi-hitting attacks. The Metal Box offers knockback resistance in that 30 knockback units will be subtracted from the total knockback taken. Combined with the increased weight, the fighter will never flinch if the total knockback taken is less than or equal to 0. However, the knockback resistance is ignored if the fighter is hit by an attack that has the bury effect. There are two unrelated phenomena with similar effects; one is known as faux super armor, which occurs when two characters are hit with the same hitbox while one has the other in a grab. Whoever has higher controller port priority takes full damage but only flinching slightly from the attack, while the other takes full damage and full knockback. The other phenomenon is called grab armor; in Brawl, when a grab connects with a character that also has an active hitbox, the character that attempted the grab takes the full damage from the hitbox but not the knockback, giving the illusion that grabs have launch resistance, though this will only occur if the grab actually connects with the other character's hurtbox, and in both previous games, the same character would not have taken the damage. In Smash 4, this situation is reversed; the character that attempted the grab will now take full damage and knockback from the hitbox, and the other character will simply be grab released and take 3% damage (or more if the grab came from a special move and the grab itself dealt damage, like the beginning of Falcon Dive). Grab hitboxes ignore all variations of armor. All bosses except Giga Bowser in Melee and Master Core's doppelganger form in Smash 4 cannot flinch or be knocked back at all, similar to the effects of super armor. Yoshi double jumping through an attack. Armor is not an established mechanic in the first two games. In both games, launch resistance is limited to Yoshi's double jump cancel counter and crouch canceling, neither of which are infinite. The difficulty setting on the single player modes (and events in Melee) alters launch resistance for both the player's character and the CPU characters, with the player's character taking more knockback and the CPUs taking less knockback as the difficulty setting increases. Adjusting the handicap levels in the multiplayer modes in Melee has the same effect. According to the Japanese Super Smash Bros. website, Yoshi's double jump resistance works by subtracting 120 units from the knockback that would have been delivered, with Yoshi not flinching if the result is negative, and Yoshi taking the difference in knockback if the result is positive. Nana has 5 units of launch resistance by default. Kyu Puff's tweet on the subject shows Nana not flinching when being hit by the weak hit of Luigi's up special. Armor was formally introduced in Brawl. Several characters have moves that provide them with infinite launch resistance, usually to allow for such characters to counter attempts to disrupt the incoming attack. Some of these moves are not offensive, however, and there are a few cases of finite launch resistance, as listed below. Crouch canceling no longer affects knockback, but instead affects the amount of freeze frames sustained. All of the moves below have super armor, unless a threshold is stated. Donkey Kong Giant Punch 17-18 Grounded version only. Spinning Kong 10-16 Grounded version only. If Donkey Kong leaves the ground while the super armor is active, a glitch will make the super armor last for the entire move. Cargo throw Entire duration Donkey Kong gains knockback-based launch resistance while the opponent gains super armor. Also works while holding heavy items. Ganondorf Flame Choke 17-40 In the grounded version, the opponent also gains super armor. In the aerial version, the opponent still gains super armor but Ganondorf does not, allowing for strange KOs in places like Norfair or Brinstar where Ganondorf will bounce off the acid, while the opponent will continue their plummet. Ike Eruption 6-10 When releasing the charge. King Dedede Super Dedede Jump 23-? Kirby Stone Entire duration (once transformed) Will flinch when taking more than 29% damage while in the transformation and take the full knockback of the move that causes him to exit the transformation, but none of the damage. Pit Mirror Shield 4-6 Grounded version only. Snake Cypher 8-96 Armor ends if the move is cancelled. Will flinch to attacks that deal more than 7% damage. Wario Waft 5-10 When fully charged. Yoshi Midair jump Entire duration Yoshi retains the midair jump armor from previous games, and it can still sustain 120 units of knockback. However, instead of taking the difference in knockback if the attack is strong enough to surpass the armor, Yoshi takes the full knockback of the attack. The editor who added this tag elaborates: Needs exact armor threshold for Donkey Kong's Cargo Carry, and needs frame data on the items. Smash 4 continues the trend of implementing launch resistance to certain characters, though there is more variation with the strength of armor (some negligible, some infinite, and some based on damage). Crouch canceling now acts as a combination of Melee and Brawl's version of the tactic, although the knockback sustained is only reduced to 0.85× the original value. Bowser Tough Guy (All animations) Bowser has universal armor that applies at all times, where he will not flinch from hitboxes that deal 19 or less units of knockback. Referred to as "Tough Guy" in the tips. This armor can be used alongside crouch cancelling to give Bowser an increased range of when this armor will work, especially when paired with items like the Super Mushroom and Metal Box. However, Bowser loses the crouching bonus once he crawls or initiates any other action. Giga Bowser Giga Bowser retains the infinite knockback resistance from Brawl. Bowser Jr. Clown Kart Dash During the move it possesses heavy armor up to 7% damage. However this armor only affects hitboxes that touch only the Kart's hurtbox; any hitbox that touches the Koopaling's hurtbox will completely ignore the armor and hit as normal. Grounding Dash Starting from frame 1 it possesses super armor, with it ending after frame 31, and it still has this super armor range if initiated while airborne. Meteor Ejection Possesses super armor during the startup of the move, from frames 9 to 20. Captain Falcon Heavy Raptor Boost For both the grounded and aerial versions, when Falcon initiates the attack phase of the move, it possesses super armor throughout the entirety of it, during frames 1 to 17 after initiation. The dashing phase however has no sort of armor at all. Charizard Flare Blitz During the charging forward phase, starting from frame 23 and lasting until after frame 53, Charizard has heavy armor which ignores hitboxes that deal up to 14% damage. A hitbox that deals more than 14% will ignore the armor and launch Charizard with its usual knockback. Once Charizard comes in contact with a hurtbox or any other obstacle and initiates the explosion phase, this armor deactivates. Blast Burn Same 14% heavy armor as Flare Blitz during its charging forward phase, except it starts on frame 28. Fly During the move's start-up and initial hitboxes like in Brawl, it possesses super armor starting on frame 4 and ending after frame 15, ending one frame before its second set of hitboxes comes out. Rising Cyclone Like Fly, but its super armor starts later and covers a stricter range, staring on frame 13 and ending after frame 18, also ending one frame before it second set of hitboxes come out. Fly High Despite lacking any sort of hitboxes, the move still possesses super armor like Charizard's other up specials, from frames 11 to 19. Rock Smash Possesses super armor during the move's start-up, starting from frame 5 and ending after frame 23, one frame before the first hitbox comes out. The armor does not activate if the boulder is broken before Charizard headbutts it. Rock Hurl Like Rock Smash, except the super armor starts on frame 1 and ends after frame 20, one frame before its first hitbox comes out. Mega Charizard X For the entire duration Charizard is transformed it possesses super armor, while sustaining half damage from attacks. Dark Pit Electroshock Arm Possesses super armor during a portion of the beginning charge, from frames 11 to 26, for both the grounded and aerial versions, while the super armor is lost the instant it initiates the attack phase. Electrocut Arm During the readying phase of the move, it possesses super armor from frames 7 to 40 after initiation. Upon activation of the attack phase, it has super armor during 1 to 8 frames after activation, ending as its hitboxes cease. The aerial version possesses the same super armor durations. Donkey Kong Cargo throw Gains knockback-based heavy armor while carrying the opponent or heavy object (i.e. boxes, crates etc.). Giant Punch When fully charged, the move possesses super armor as Donkey Kong unleashes the punch, when his arm is moving forward just before and during the punch, from frames 11 to 20. If used while airborne it still possesses super armor but in a stricter range, from frames 17 to 20. Stubborn Headbutt The move possesses super armor starting from frame 1, and lasts through its entire startup and a bit through its endlag, ending after frame 54. It possesses the same super armor range if initiated while airborne. Spinning Kong If initiated on the ground, DK gains super armor when he pulls back and just before he starts spinning, from frames 8 to 17, ending 2 frames before its first hitbox comes out. If initiated in the air it possesses no sort of armor at all. Kong Cyclone When initiated on the ground it possesses super armor from the 2nd hit in front until shortly before the last 2-3 swings, from frames 20 to 45. If initiated in the air it still possesses super armor, though it activates faster with a stricter range, from frames 15 to 35. Ganondorf Warlock Punch When initiated on the ground, the move will have super armor until Ganondorf begins his punch forward during most of its startup, with Warlock Punch having super armor from frames 11 to 66, ending four frames before its hitboxes comes out. While in earlier versions of the game the reverse variation had no armor, version 1.1.3 added super armor to it, albeit in a stricter range; super armor covers frames 21 to 68 for reverse Warlock Punch, ending 22 frames before its hitboxes come out. Neither variation has any sort of armor if initiated while Ganon is airborne, even if Ganondorf lands on the ground before punching. Warlock Blade Its super armor works similarly to Warlock Punch, except it has super armor from frames 8 to 52, ending one frame before its windbox comes out and eight frames before its hitboxes, while when reversed it has super armor from frames 11 to 54, ending nine frames before its windbox comes out and sixteen frames before its hitboxes. Also just like Warlock Punch, the reverse variation had no armor in pre-1.1.3 versions of the game, and neither variation has armor if the move is initiated while Ganondorf is airborne. Flame Choke/Flame Wave In the grounded versions, when Ganondorf has someone grabbed, he and the opponent possesses super armor starting from frame 17 of the grabbing phase, and it ends after frame 40 for Flame Choke, while Flame Wave's ends 1 frame later at frame 42. Dark Fists Possesses super armor during the startup of the move, from frames 6 to 16, with it ending the frame after its first hitbox comes out. Ike Eruption/Furious Eruption Only gains super armor 3/4 to fully charged, with the super armor activating during 6 to 10 frames after the special button released, ending 1 frame before its first hitbox comes out. Tempest Its super armor works the same as Eruption's, except it has super armor during a slightly different range of frames 5-8 after the special button is released, though still ending 1 frame before its first hitbox comes out. 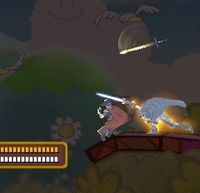 Unyielding Blade Starting from frame 15, Ike possesses super armor while charging the move. When Ike releases the move on the ground, he has super armor throughout the entirety of dashing phase starting from frame 1, until he goes into its endlag or helpless state. During the attacking phase Ike possess super armor from frames 1 to 5, ending after its hitboxes cease. Aether/Aether Drive Ike gains a brief duration of super armor while his sword is thrown upwards from frames 18 to 21. Aether Wave Like Aether it briefly has super armor when Ike is throwing his sword upwards, from frames 12 to 15. It also possesses super armor when Ike lands on the ground with it, starting from the first frame Ike lands and ending 15 frames later. King Dedede Super Dedede Jump Just like in Brawl, it has super armor during the rising phase of the move, until Dedede reaches the apex of his jump, from frames 26 to 32. Also has some duration of super armor after Dedede starts descending upon its first descent hitbox activating, from frames 73 to 80. Both durations of super armor end the instant Dedede lands with the move or cancels it. Rising Dedede Like Dedede Jump it has super armor during the rising phase of the move, though it activates slightly faster, starting on frame 23 and ending after frame 27, which also covers some of the range it possesses hitboxes. The super armor ends the instant Dedede cancels the move. Quick Dedede Jump Like Dedede Jump it has super armor during the rising phase though it activates drastically faster, being active from frames 3 to 8. It also similarly has super armor upon when Dedede first begins his descent, from frames 25 to 33. Both durations of super armor end the instant Dedede lands with the move or cancels it. Armored Jet Hammer From the first frame Dedede starts charging the move, it has super armor until Dedede unleashes the move or is interrupted by other means, regardless of if he is on the ground or in the air. Once Dedede releases the move and it's not fully charged, it has super armor from frames 1 to 10 after release, ending five frames before its first hitbox comes out. If Dedede released while the move was fully charged, it has super armor from frames 1 to 12 after release, ending the frame before its first hitbox comes out. These same super armor durations apply to releasing the move while airborne. Kirby Copied moves If Kirby copies any neutral specials that possess armor, the armor of Kirby's copied equivalent will function exactly the same. Hammer Flip When fully charged, it'll have super armor during its swing, from frames 11 to 13 after release, ending two frames after its hitbox comes out. Giant Hammer Once Kirby begins charging the move, he'll have super armor until the frame he unleashes it or until he is interrupted by other means. If he releases the move while fully charged, super armor will activate from frames 5 to 13 after release, ending two frames after its hitbox comes out. Stone/Grounding Stone/Meteor Stone Kirby possesses a unique type of damage-based heavy armor while transformed; he can sustain up to 24% damage while transformed, where he'll take no knockback from all moves regardless of how strong their knockback is, while also taking no damage and remaining transformed. Once he sustains more than a collective 24% damage per transformation however, he'll be launched as normal, while taking half the damage from the threshold-breaking hitbox. Little Mac All smash attacks Little Mac's smash attacks all have super armor during their start-up; unangled and up-angled forward smash have super armor during frames 8-15 while the down-angled version has super armor during frames 9-15; up smash has super armor during frames 8 to 11; and down smash has super armor on frames 7 to 10 (before the first swing) and frames 15 to 17 (before the second swing). Straight Lunge/Flaming Straight Lunge Starting from the first frame of activation, Little Mac gains 8% heavy armor during the entirety of the charging and attacking phase of the move, until he goes into the endlag of the move, regardless of if it's on the ground or airborne. KO Uppercut The grounded version has a brief duration of super armor from frames 8 to 9, the frame its first hitbox comes out. The aerial version has no sort of armor at all. Guard Breaker During the jumping forward phase of the move, it has super armor from frames 12 to 34. When the attacking phase is activated, it has super armor during frames 1 to 17 after activation. Both instances of super armor function the same for both the grounded and aerial versions. Giga Mac Little Mac possesses super armor for the entire duration he is transformed. Lucario Mega Lucario Lucario possesses super armor for the entire duration he is transformed, while taking half damage. Mii Brawler Ultimate Uppercut If released on the ground, it possesses brief super armor during frames 10 to 12 after release if it wasn't fully charged, ending the frame after its first hitbox comes out. If fully charged, it has super armor from frames 7 to 14, ending three frames after its first hitbox comes out. If initiated while airborne, it has no sort of armor at all regardless of how much it was charged. Exploding Side Kick A bit before the kick is released, it possesses super armor during frames 40 to 53, ending after its hitboxes cease. If reversed, it has super armor during frames 48 to 61, also ending after its hitboxes cease. The aerial version possesses the same super armor duration for both variations. Olimar Pikmin Order Like Brawl it possesses super armor, though for a shorter duration, from frames 6 to 12. Pac-Man Power Pellet/Distant Power Pellet/Enticing Power Pellet After Pac-Man eats the Power Pellet, he has super armor until he enters the move's ending lag. Pit Upperdash Arm Possesses super armor during a portion of the beginning charge, from frames 11 to 26, for both the grounded and aerial versions, while the super armor is lost the instant it initiates the attack phase. Interception Arm During the readying phase of the move, it possesses super armor from frames 7 to 40 after initiation. Upon activation of the attack phase, it has super armor during 1 to 8 frames after activation, ending as its hitboxes cease. The aerial version possesses the same super armor durations. Roy Blazer When initiated while grounded, it has super armor during its startup from frames 4 to 10, ending the frame after its first hitbox comes out. It has no sort of armor if it's activated while airborne however. Ryu Focus Attack While charging the attack, Ryu will be able to withstand any single hitbox that deals less than 22%-39% damage; the exact value depends on how long he has been charging Focus Attack, anywhere between frames 1 to 59, with the threshold increasing the longer he charges the move. A move that breaks this threshold will launch Ryu as normal, though he will take half damage from any hit regardless of if it broke through the armor or not. However, if he is hit again while having already withstood another hitbox, he will take the full damage and knockback of that hitbox, regardless of how weak it is. Wario Wario Waft If it is released while fully charged, Wario will possess super armor during the startup from frames 5 to 10, ending after the initial hitboxes cease. Wii Fit Trainer Volatile Breathing Starting from frame 1 of the move's startup, it'll possess super armor, with the armor ending immediately upon the special button being hit again, regardless of if the attack was successfully activated or not. Steady Breathing Upon successfully using the move, Wii Fit Trainer will possess universal super armor for 21 frames. Yoshi Midair jump Yoshi retains the same knockback-based heavy armor from Brawl during the entire portion of his midair jump, being able to sustain up to 120 units of knockback, while Yoshi will sustain the full knockback of a hitbox that exceeds this value. The armor activates the first frame of Yoshi initiating a midair jump and lasts for 69 frames, while it deactivates the instant Yoshi initiates any attack, an airdodge, or when his midair jump is interrupted by any means. All characters Home-Run Bat When the bat is about to be swung. Ore Club When charging and releasing a smash attack. A better 'Super Armor List' Thread: lists characters and their moves that have Super Armor, along with some frame data. The Armor Project: explains how knockback-resisting moves that are not super armor work, including Snake's Cypher and Yoshi's midair jump. This page was last edited on April 21, 2019, at 18:21.